Assailants shot three!-- looted Rs 50 lac cash. 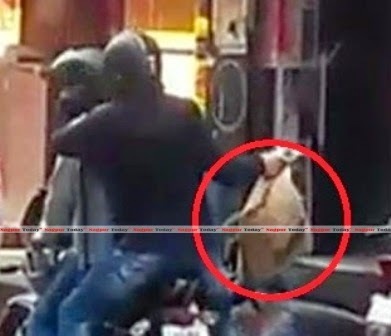 Two motor cycle borne masked men on Friday noon shot three persons at a private bank ATM in a broad day light robbery on a busy Lucknow road and fled with the cash box having Rs50 lac. The employees were loading cash in the ATM around 12.20 P.m. of the HDFC bank at Babuganj locality in front of Lucknow University campus under Hasanganj police station. Chief Minister, Akhilesh Yadav, directed DGP A.K. Jain to deal personally the investigating team and gave him 15 days to crack the case and to arrest the accused with cash recovery. Akhilesh also announced an ex-Gratia of Rs. 5 lac each to the next kins of the three victims. The DIG said the cash carrying van, a private vehicle, had loaded cash in three other ATMs before arriving at the one in Babuganj. Employees, Anil Kumar Singh and Uday Singh, were inside the outlet for loading cash into the machine while security guards, Avneesh and Arun Kumar Shukla, were vigilant outside. Two masked gunmen arrived on a motorcycle and opened fire to shoot the armed guards, giving no chance to retaliate. As the guards fell on the ground, duo entered inside the outlet and asked the two employees to hand over the box. One of them, Anil, reportedly resisted, the assailant fired at him forcing Udai to back down. The assailants fled with the cash box on their motorcycle . The two guards died on the spot, and Anil died at the KGMU trauma center.